Bonds Restaurant and Bar opened in 2002 with head chef Barry Tonks taking the helm in 2004. Formerly a bank, the restaurant offers up a blend of American walnut floors, oak fittings and magnificent columns. Classy and chic is what this place is, and its most spectacular feature, a stained glass vault roof, is a sight to behold. Tonks’ CV doesn’t read too badly either, and includes time spent at Michelin starred Chapter One and the now closed Putney Bridge Restaurant with Anthony Demetre. He then became Senior Sous Chef at The Landmark under John Burton-Race, during which time the restaurant earned two Michelin Stars. Finally, as the head chef at McClements, Tonks gained his first Michelin star at the age of 30. 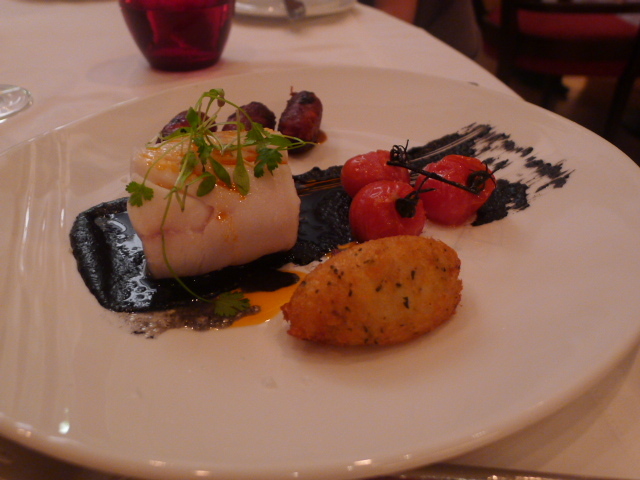 I recently dined at Bonds as part of a bloggers dinner. A hand made ‘native blue’ lobster raviolo was fat and tasty (£16.95). It was too big to be considered elegant, and visually, the dish looked rather dull. 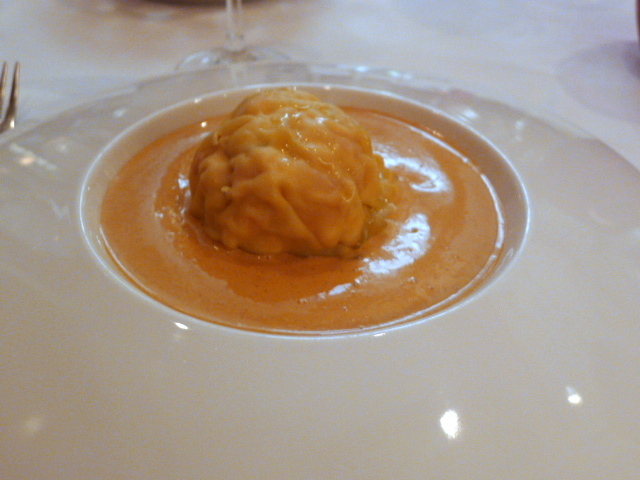 Nevertheless, I enjoyed the plumpness of the raviolo as it was generously filled with lobster. It was finished with a heady and creamy Armagnac bisque which worked well with the delicious meaty filling. A pickled Dorset Bay crab (£14.95) was lovely and fresh, allowing the natural sweetness of the crab to shine. However, I would have preferred a touch more acidity in the crab for something that was meant to have been pickled. The portion of red crab meat on the plate was generous, and the dish was accompanied by a fantastically fresh and aromatic pea and pistachio mousse. 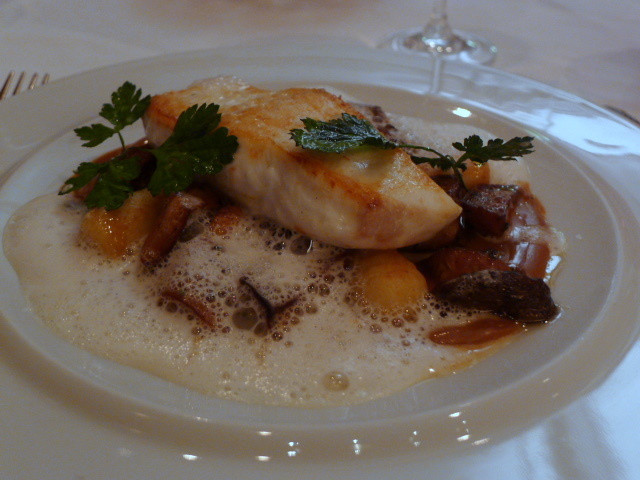 Scottish halibut a la plancha (£24.95) was a little overcooked and consequently dry. But it was served with a wonderfully nutty, sweet Jerusalem artichoke puree which, with the wholesomeness of a poultry jus and meaty king oyster mushrooms, provided bags of magical flavours. This was the type of dish that made you want to lick the plate. There were also some good, but slightly floury potato gnocchi thrown into the mix. This would have been an almost perfect dish had the halibut been less dry. Peterhead cod poached at 48c (£21.95) was beautifully cooked to a lovely moistness. But the strong meaty flavour of the chorizo and the saltiness of the cod and choux pastry beignet which came with the cod overpowered the delicacy of the fish. Conceptually this dish didn’t work. 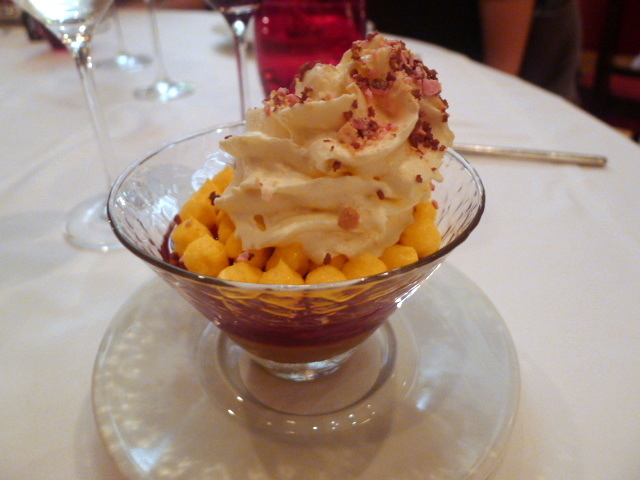 Disappointingly, a strawberry and sherry trifle (£6.95) was bland. 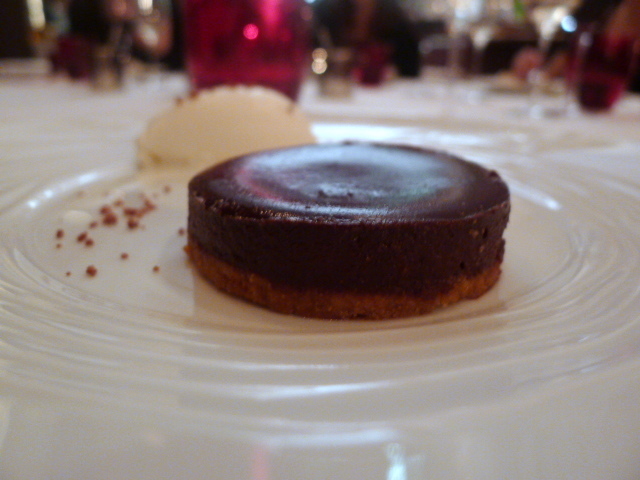 Better was an Amadei 70% chocolate fondant (£7.95) which was more akin to an almond biscuit base covered with chocolate ganache than a baked-with-a-runny-centre-type fondant. The chocolate was nice, but I had expected more richness from a 70% chocolate. The accompanying almond milk sorbet was pleasant, but the lightness of its flavour didn’t hold up against the chocolate. Overall, this was a resoundingly good meal. There were some minor errors, and the composition of the cod dish was questionable. But there were also some fantastic flavours that were wonderful and comforting, and which allowed me to walk away feeling satisfied and happy. Hard to score this one. The food was better than 3.5/5, but not quite worthy of a 4/5. The cod fish and the trifle let the menu down. Anyway, it’s somewhere in between the two, and I enjoyed it enough to want to go again, especially when the surroundings are so lovely. Price range: £31 – £59 for three courses. Excludes drinks and service.